In the ongoing coverage of exploring new startups coming out of Australia, today we explore a promising startup - RetailMeNot.com. Its co - founded by Bevan Clark and Guy King of Stateless Systems, Sydney, Australia. 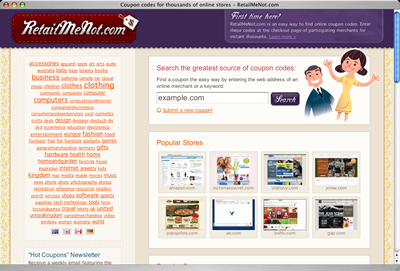 Our flagship website, RetailMeNot.com, was built over a weekend at the end of October 2006 - after Guy spent an hour or so hunting through heaps of 'spammy' coupon sites that promised coupons, but didn’t deliver, while shopping online. Stateless Systems was founded a few days after when Bevan came onboard to help grow and monetize the site. Our success with RetailMeNot.com—which now receives more than six million visitors per month—has enabled us to continue building new websites. It took about a week to get the website RetailMeNot.com up and running, but we’ve been making improvements ever since we launched. The most recent upgrade was creating a closely integrated social network so that shoppers can connect with each other to get the best offers and deals. RetailMeNot.com currently has more than six million visitors per month and traffic continues to grow by 20% each month since the site was founded in late 2006. More than eight million people visit Stateless Systems websites each month. Public relations and word of mouth. Google Analytics is our friend - we use it to measure visitors to RetailMeNot.com and how they interact with the site. Our revenue is mostly based on Google Adwords and commission on sales for some merchants. There are dozens of smaller coupon sites that compete with RetailMeNot.com, but none come close in terms of web traffic. We are successful because we put user needs first. Macs, Firefox and Google Docs - forget unreliable PC operating systems, non-standards compliant browsers and expensive office software and go with the free stuff in the Cloud. The Internet is the great equalizer. Anyone can build a website on a shoestring to launch a new venture, and being physically located in Australia is no excuse for not achieving success overseas. Remove the red tape and get the paperwork online already! The sheer amount of paperwork around and starting a business and hiring people is soul destroying for a startup operating on shoestring staff. Oh, and the ATO should really learn how to deal with Internet companies earning revenue 100% overseas. We have a bunch of friends in the industry that we catch up with on a regular basis, nothing really organised though because that would take the fun out of it. 1. Place user needs before revenue—The users will follow and that will bring revenue. 2. Question traditional business practices—For example, we use free online services for email, word processing, spreadsheets, presentations and accounting in place of traditional software. 3. Fail fast, fail often—You learn the most from failures. The more you experiment with ideas the more likely you are to find a runaway success. 4. Build something you’d use yourself—Chances are, if you’re fixing a problem that bugs you then it’s also bugging a bunch of other people out there. 5. Sometimes it’s better to know less—It is possible to disrupt established industries by not being aware of the limitations. For example, many thought the search arena was pretty well stitched up before Google hit the scene. Common thinking at the time was search was about as good as it was ever going to be. 6. If you succeed, every man and his dog will copy you - The only real way to fight this is to out-innovate and never look back. Bevan Clark, co-founder and director of Stateless Systems: Bevan have led Research and Development at a Top 10 Australian website and managed e-commerce and web development teams for over 5 years. He completed secondary school and then traveled throughout Asia and Europe including one year of study in Germany, 18 months working and traveling in the UK and the completion of a Bachelor of Business (Management Information Systems). It was during that time, he became infatuated with the quickly growing Internet. He began his career at a financial services company's IT department, where he experienced the exponential growth of the Internet over a few short months; He was entirely overwhelmed by the power of the medium, and his fate was sealed. Guy King, co-founder and director of Stateless Systems: Guy has worked in corporate R&D and Web development. He has more than ten-years of intensive experience in Web strategy, branding, interface design/development and programming. Thanks Bevan for sharing your thoughts with us. All the best for future.